Sean J Vincent Blog: AudioMedia publish feature on making of Shoot The DJ. 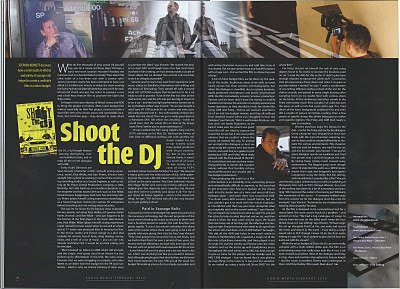 AudioMedia publish feature on making of Shoot The DJ. Last week i did an interview with Stephen Bennett from AudioMedia and the resulting article is in this month's issue which has just come out. It's great to have support like this from the production based press... i know i always love reading about other indie productions and i hope other film -makers will enjoy reading our article. We're heading down to the Broadcast Video Expo tomorrow at Earl's Court. Hopefully we'll see some of you there.